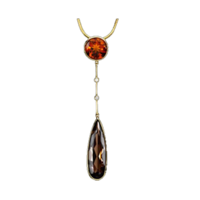 Accentuate your neckline and bring out your very best with a gorgeous gemstone necklace. Our superb collection features the finest quality gemstones cut by craftsmen and set in exquisite designs from casual to chic and everyday to elegant. 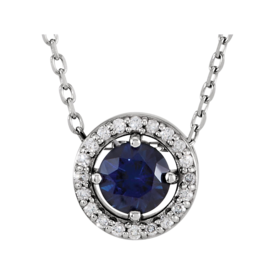 Beautiful 14k gold Blue Sapphire and diamond halo necklace. 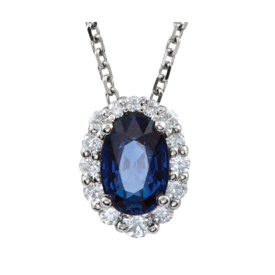 Genuine Blue Sapphire is surrounded with a diamond halo in this design. Necklace is 16" in length. Center vibrant Blue Sapphire measures 4.5mm round and is an AA quality. 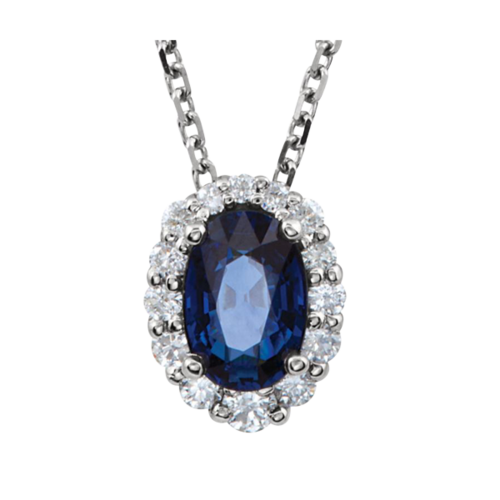 You'll love this Blue Sapphire necklace. 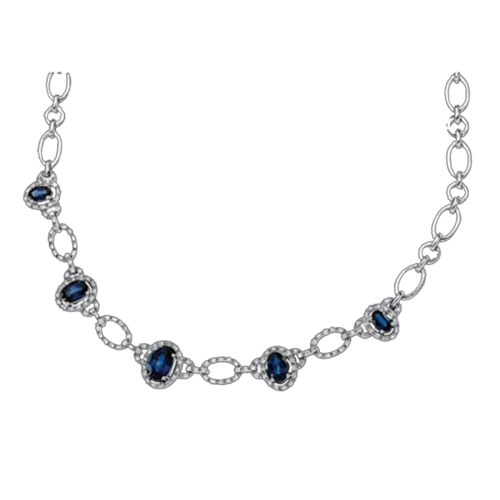 Beautiful 14k White gold Blue Sapphire and diamond necklace. Vibrant rich Blue Sapphire is AA quality and measures 6x4mm oval. It's surrounded in a halo of 1/6ctw diamonds. Wear this gorgeous necklace to that special event or a romantic evening with your special someone. Necklace measures 18 inches in length. 14k Gold Citrine checkerboard necklace with diamond accents. Citrine is an 8mm round gemstone accented with .04ctw diamonds. This vibrant Citrine necklace is 18 inches in length. Citrine is November's birthstone, what a lovely gift idea. 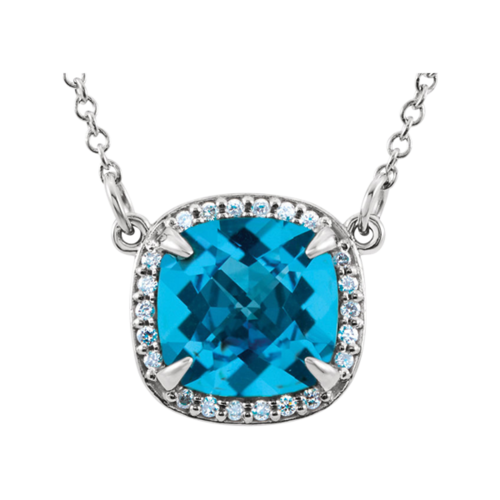 Stunning 14k White gold London Blue Topaz sculptural design necklace. Pear shaped Topaz measures 12x8mm, simply gorgeous necklace. Check out our video. 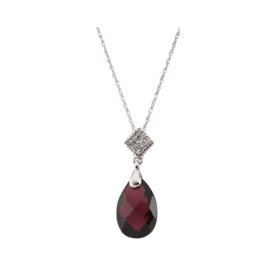 Beautiful 14k White gold Genuine Brazilian Garnet and Diamond necklace. 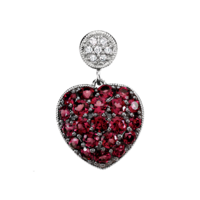 Brilliant garnets are a delightful color and total 1.75ct tw. Vibrant accent diamonds total .06ct tw. Necklace measures 18" in length. Wonderful gift idea. Rich purple marquise Amethyst create the Dragonfly's wings and center body accent with diamonds. A whimsical necklace. Great necklace for everyday wear. Pretty 14k White gold Swiss Blue Topaz and diamond necklace. 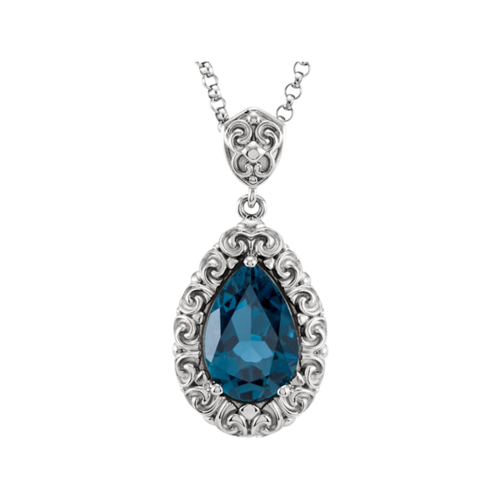 Necklace measures 16" in length and Swiss Blue Topaz measures 8x8mm, a cushion cut stone. Accent diamonds are a nice accent. Lovely cushion cut gemstone accented with a diamond border necklace. 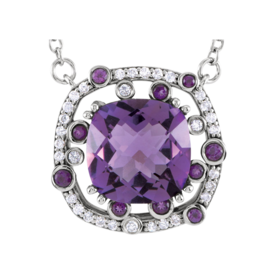 Gemstones include Amethyst (shown), Blue Topaz, and Opal. Pendant measures 21.5mm in length by 11.5mm across. Necklace is 18 inches in length. 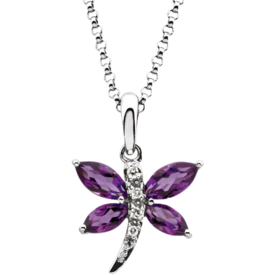 Tantalizing 14k yellow gold Amethyst and diamond nest design necklace. Diamonds in a collar accent total .06ct and are a nice accent. Necklace measures 18" long and the center piece measures 35.8mm top to bottom by 20.5mm wide and 8.7mm thick. A beautiful royal design you're going to love. 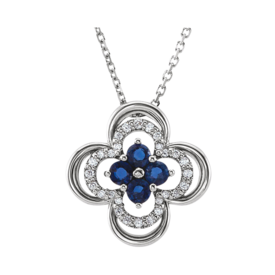 Lovely Blue Sapphire and Diamond clover design necklace. Necklace available in 14k white, yellow, or rose gold and by special order Platinum. Necklace measures 18" in length. Clover design is 12.5mm in length and across. Diamonds total 1/10ctw and Blue Sapphires are each 2.5mm round. 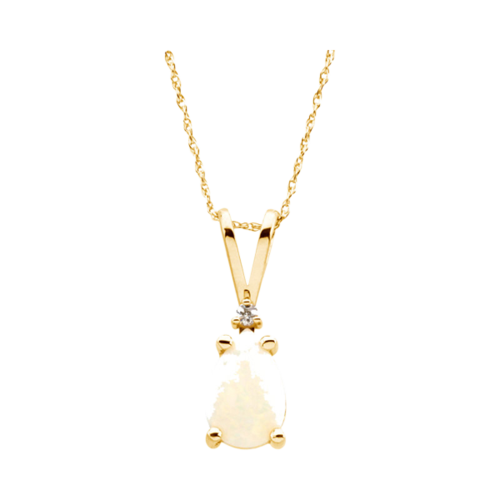 14k Yellow gold Opal and Diamond necklace. Pretty necklace features a pear shape 9x6mm genuine Opal and dainty diamond accent. Necklace measures 18 inches in length. Enchanting 14k white gold diamond and blue sapphire necklace. Delicate design in white gold features a 6x4 pear shape genuine blue sapphire at it's center. Diamonds total 1/4ct tw in this lovely design. Necklace measures 18 inches in length. Autumn gemstone necklace. 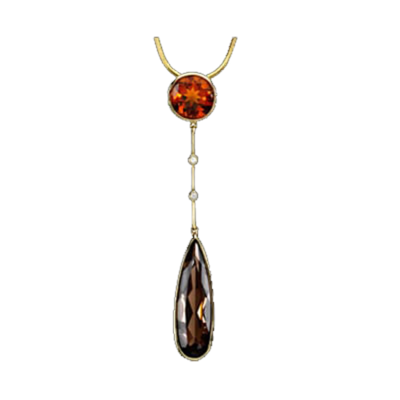 Delightful 14k yellow gold dangle necklace features a 9x9mm Madeira Citrine followed by 2 .01ct diamonds then a large 23x7mm smoky quartz. 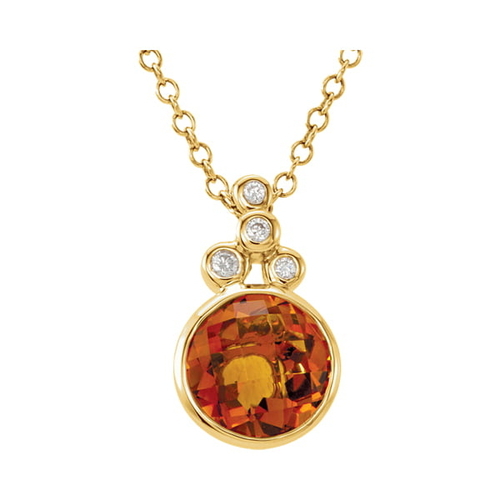 A great fall colored necklace. Great pendant hangs from a 14k gold 1mm 18" box chain. Genuine Emerald and diamond necklace. 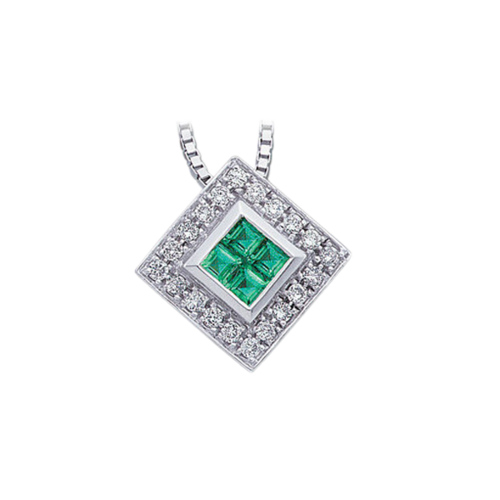 Beautiful 14k white gold is invisible set with 4 square Emeralds then surrounded with diamonds in a diamond shape. Emeralds total .32ct diamonds total .26ct. This lovely necklace measures 18 inches in length. 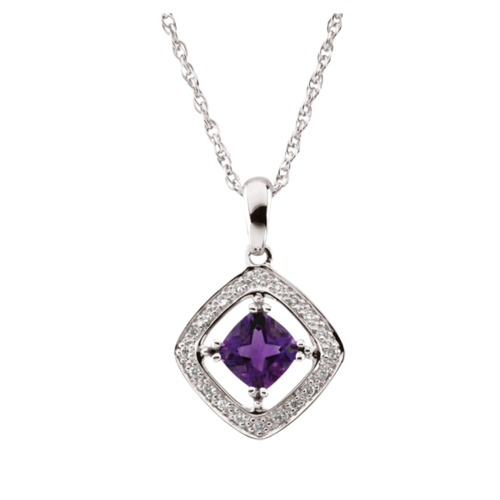 Amethyst and diamond white gold necklace. 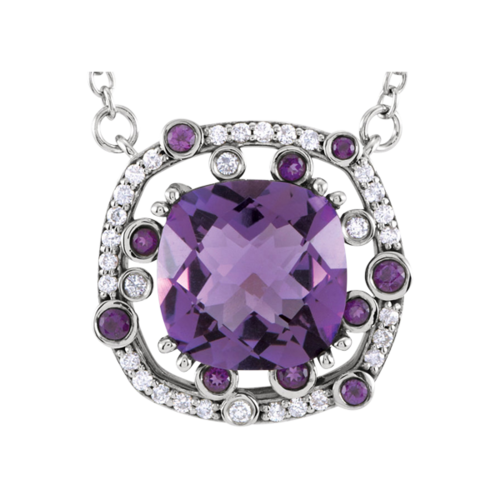 Rich Amethyst center is a large 10 x 10mm checkerboard cut stone accented with diamonds and amethyst create this beautiful necklace. Diamonds total 1/6ctw. This necklace is 18 inches in length. 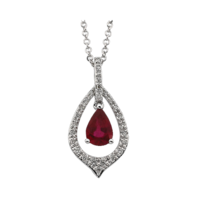 Brilliant Brazilian Garnet 14k White gold necklace. Garnet measures 12 x 8mm and hangs from an 18" 14k white gold chain with .04ct diamond accent. 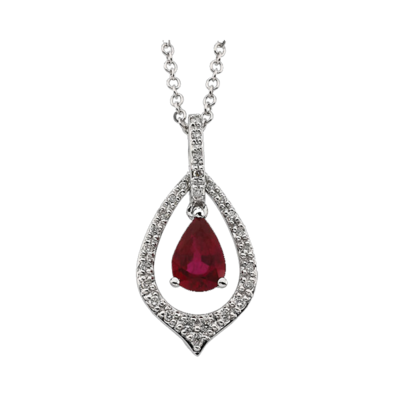 Ruby Diamond Necklace. 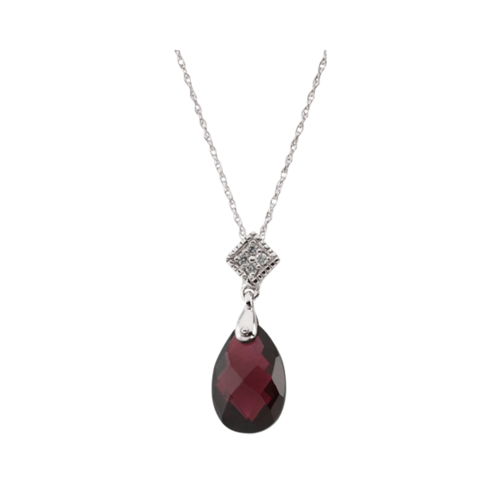 14k White gold genuine Ruby and Diamond necklace. 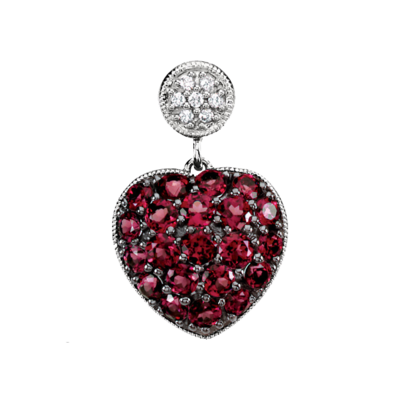 This beautiful Ruby and Diamond necklace is set with a genuine 7x5 A grade pear shape Ruby and 1/6ct diamonds. Fantastic necklace. 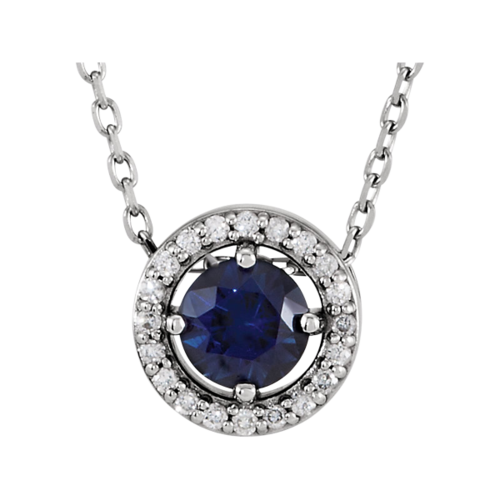 Gorgeous genuine Tanzanite and diamond necklace. Tanzanite measures 6mm round and is an "AA" quality gemstone. Diamonds total 1/5ct tw and are SI1-2 clarity, G-I color. A fabulous gift idea, matching earrings also available. Necklace measures 18 inches in length, chain is 14k White gold singapore style chain. Available in other metals including Platinum. 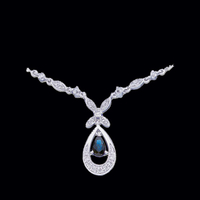 Stunning Sapphire and Diamond necklace. 14k White gold is set with 3/4ctw diamonds and oval rich blue Sapphires. Center Sapphire is a 7x5mm oval AA grade gemstone, next are 2 6x4mm oval Sapphires, then 2 5x3mm Sapphires. Necklace weighs and incredible 19grams and measures 18 inches long. 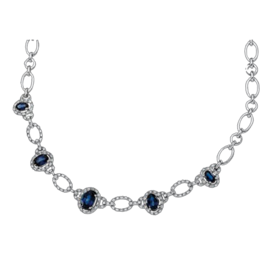 This show stopper Sapphire and Diamond necklace is sure to be your favorite.